DeathNote Ransomware is not a program that you want to find up and running on your operating system. That is so because this malicious piece of software exhibits malicious functionality as few other devious programs do. Ransomware applications are defined by their ability to encrypt large numbers of files without requiring any authorization. Having a devious program of this classification active on your personal computer could have disastrous outcomes, to put it lightly. Our researchers have conducted an extensive analysis of this malicious program, and in this report we provide their findings in detail, allowing you to understand its complex inner workings. Alongside such information, you will find a few virtual security recommendations that will help you maintain a secure operating system at all times. To help you delete DeathNote Ransomware once and for all, we also include a detailed removal guide crafted by our malware experts. DeathNote Ransomware starts acting as soon as it gains successful access to your operating system. Once you launch its executable file, it will immediately drop its files all over your operating system. Right after that, it will start playing a loud shooting sound. The next step in the chain of action should be an encryption procedure; however, it does not do that. Due to such poor functionality, our researchers have determined that this malicious piece of software is still in its developmental stages. While that happens to be the case at the moment, it is crucial to understand that it could start doing its dirty work without any notification at any time. Thus, keeping this malware active on your personal computer could lead to devastating outcomes, to put it lightly. That is so because this ransomware could encrypt a massive amount of data on your computer in just a few minutes. All the affected files would be locked with a robust algorithm to eliminate any chances of manual decryption. Furthermore, it is imperative to note that even though this malware does not encrypt files, it still issues a ransom note. It falsely informs you that your data is locked and to regain access to it you must pay a ransom in return. Under no circumstances abide by these demands since your data is not affected in any way. It goes without saying, that you must remove DeathNote Ransomware without any hesitation if it is ever found active on your personal computer. To do so quickly and easily, make sure to use the instructions below. To have a secure operating system at all times, you must take a few simple precautionary steps to improve your virtual security. First, it is important to note that in the majority of cases malicious applications are spread deviously. Thus, we highly advise you to practice safe browsing habits. Be sure to avoid all email attachments that come your way from unknown sources since it could be a part of a spam email campaign, which malware developers use for distribution. Likewise, you need to refrain from all unauthorized download sites because they infamously host bundled installers, which can be filled with suspicious and even malicious applications. By obtaining all of your programs form their official developers' sites, you will significantly lower the risk of coming across a malicious installer. Also, you need to educate yourself about any application before you acquire it and install on your operating system. It is critical to do so because malware developers often use manipulative and otherwise misleading marketing tactics to trick naive Internet users into downloading their intrusive applications. Lastly, but most importantly be sure to install a professional antimalware tool because it is designed to detect and delete any dubious program automatically. By taking these simple precautionary steps, you will make your operating system virtually unbreakable. To remove DeathNote Ransomware once and for all, make sure to follow our instructions with care. It is imperative to follow each step with precision because a single mistake could result in an incomplete removal, which could lead to undesirable consequences. In some instances, leftovers of DeathNote Ransomware could be just enough for it continue its dirty work. Also, traces of this malware could be used for its restoration. You can avoid finding yourself in such a situation, be sure to double-check your operating system for anything associated with DeathNote Ransomware once you are done with the removal guide below. 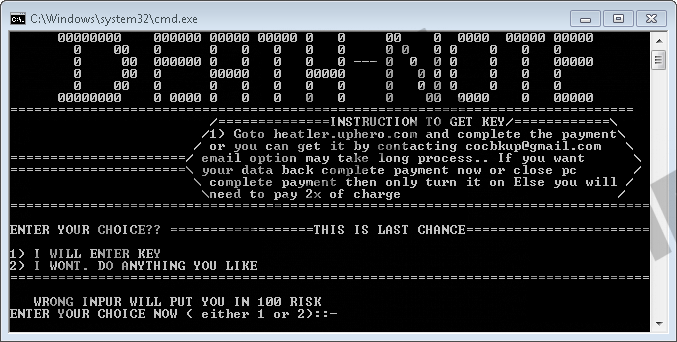 Quick & tested solution for DeathNote Ransomware removal.